TRILOK STEEL INDUSTRIES is one of the renowned manufacturer, exporter, stockist, stockholder and supplier of Stainless Steel Corrugated Tube . Our offered Stainless Steel Corrugated Tube is actually used for components of energy type tools such as steam super-heaters, boilers, steam pipelines, and so on. Stainless Steel Corrugated Tubing is prepared from low alloyed and heat resisting steels which can survive the weight at soaring temperature and pressure.We are specialises in the supply of high quality seamless corrugated tubingin stainless steel 304 and 316 grades which are highly resistant to corrosion.Trilok Steel Industries is PED approved manufacturer & Govt. of India recognized Export House and an ISO 9001 : 2008 accredited company. Stainless Steel 304 Corrugated Tubesare as well supplied as cold drawn or hot rolled. We are also well known Stainless Steel Corrugated Tube Manufacturer in India. Buy stainless steel Corrugated tubing at best price in India. 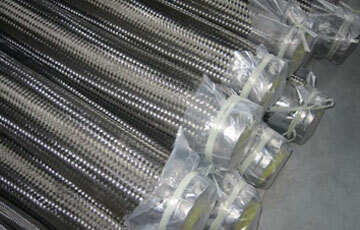 Stainless Steel Corrugated Tube Length As per Customer requirement, Maximum upto 22 Meter Long. Stainless Steel Corrugated Tube Form Round, Square, Rectangular, Coil, U Tube, Pan Cake. Stainless Steel Corrugated Tube Finish SS cottugated tubes and corrugated pipes can be supplied in mechanical polished with various grits like at 80, 120, 240, 320, 400, 600 grit and mirror polished. TRILOK STEEL INDUSTRIES is well known Stainless Steel Corrugated Tube has many characters of the good flexible, lightweight, corrosion resistance, fatigue resistance, resistance the high and low temperature. SS Corrugated Tubesare mostly used in petrochemical, metallurgical power, aerospace, construction, steel, shipbuilding, docks, rubber, paper, textile, transportation and other industries.Stainless Steel Corrugated Tubing is suitable for conveying all types of liquid and gases with extreme low and high temperature requirements. SS 304 Corrugated tubes and SS 316 Corrugated tubes formed with corrugated shape on outside surface. Stainless steel 316 Corrugated tubing can be used to connect the form of tube soft and flexible, with good defensive displacement and vibration and noise reduction, mainly used on heat ex-changers. stainless steel Corrugated tubes is used as an alternative to the older standard “black iron” (steel) gas pipe. The inner stainless steel layer of typical residential CSST is .2 to .3 mm thick while the wall thickness of typical residential “black iron” gas pipe is 3 to 4 mm thick. Corrugated Stainless Steel Tubeis more expensive than “black iron” gas pipe. However, Corrugated Stainless Steel Tubingrequires fewer joints, may be safer during earthquakes, and may be easier to install. check latest updated price of stainless steel Corrugated Tube. Stainless Steel Corrugated Tube Manufacturer in India, SS Corrugated Tubes, SS Corrugated Tube Dealer in India, High Quality Stainless Steel Corrugated Tube, Stainless Steel Corrugated Tubes Exporter in India, Stainless Steel Corrugated Tubing Trader, SS Electropolished Corrugated Tubes. Suppliers of Stainless Steel Corrugated Tubes, 304 Corrugated Tubes, Glass Corrugated Tube Manufacturers in India, SS 304 Corrugated Tube Importer, SS 316 Corrugated Tube Supplier in Mumbai, India. Stainless steel Corrugated Tubes are finished in accordance with customer needs regarding dimensional and wall thickness specifications as well as heat treatment for more demanding applications. In general a stainless steel Corrugated Tube is manufactured according to current standards API, ASTM, and ASME. If required for special projects we can also supply large diameter Corrugated Tubes.